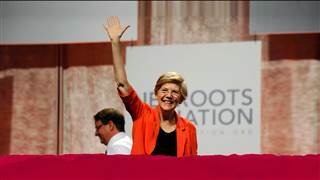 Senator Elizabeth Warren, Democrat from Massachusetts, talks with Rachel Maddow about the differences between Democrats and Republicans on issues like pay equity and student loans and what’s at stake in the 2014 midterm elections. This entry was posted on October 8th 2014 at 5:39am/05:39 and is filed under Elections, Live News Column 2, Politics, Social Issues. You can follow any responses to this entry through the RSS 2.0 feed.